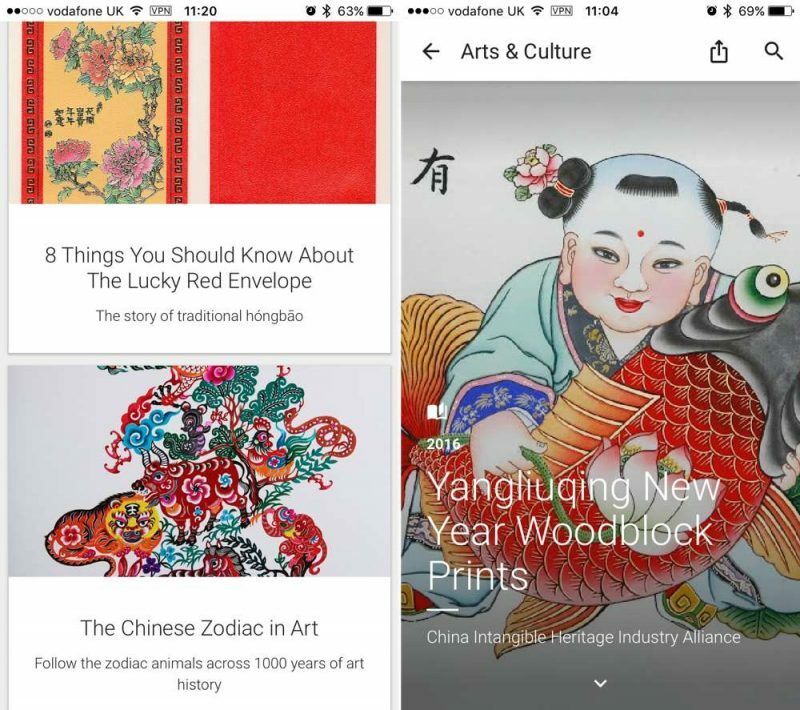 Today marks the beginning of the Chinese Lunar New Year, and to celebrate the Year of the Rooster, Google has teamed up with 12 museums from Beijing to Washington to create a new online exhibition that can be visited through the Google Arts & Culture iOS app. Across Asia and around the world, families are coming together, houses and neighborhoods are being dressed up in red and traditional lanterns are being hung. If you're still wondering about what the fireworks are all about, Google Arts & Culture is here to help you learn more about this centuries-old tradition. Titled 'Arts of the New Moon', the exhibition features rich video and interactive graphics to showcase a range of arts and crafts connected to the ancient tradition, taking in ancient calligraphy, contemporary painting, performing arts, woodblock prints, and more. The app includes Google Cardboard-compatible VR portals to explore iconic places, like the Ge Garden in Yangzhou and the Fukuoka Asian Art Museum in Japan. Elsewhere, users can follow the zodiac animals across 1,000 years of art history, and kids can play New Year-themed games starring the Red Rooster. Also to be found are interesting facts about the Lunar New Year, with a special lesson on how to give and accept a traditional red envelope. Google Arts & Culture is freaking amazing, let's you see stuff that you can't find anywhere else apart from visiting the museum itself. They really present the information very well too and it's a godsend to Art History students! The zoom viewer is pretty darn slick on the GA&C ('https://www.google.com/culturalinstitute/beta/') site. You can zoom down to the paint strokes in the art. This is just beautiful. Would like a game with approach and theme like this. I was just going to ask, "Did Apple made this?" with being surprised because it was on MacRumors and China was mentioned, until it ended with Google. Ultimately, left surprised. This does have an Apple flavor doesn't it? Regardless, damn good job. They could make wallpapers available...that would be nice. Based on previous comments, I downloaded this app. IT IS REALLY IMPRESSIVE! I only write those words infrequently (like every other year or so).